My aunt called me in the middle of the night a couple weeks ago. I thought there might be some sort of emergency, but in fact she just wanted to ask me a question: "Are you wearing red lipstick all the time now?" No. In general I wear red lipstick if I am going to party, speaking in public, or having my picture taken — it was, in fact, a recent photograph that had led my aunt to believe I'd become some sort of red-lipstick obsessive. But I'm not obsessed — I just recognize Revlon Matte Lipstick 006 for the small miracle that it is. Revlon 006 will stay on my face. It will not wipe off the minute I take a drink of water or eat a French fry. It will not bleed and smear so that by the end of the night I look like John Wayne Gacy (which is what happened with a $30 lipstick that shall remain nameless). What's more, it will remain a vibrant, matte, true red — not pink or coral or (horrors) mauve. As such, it's great for any situation where I need to look a bit formal, or where I want my somewhat small features to pop. After I explained this to my aunt, she bought herself some red lipstick, and reported that people immediately paid more attention to her. I do think Revlon 006 sends the message, "Hey! Look at my face!" which makes it great for a reading and less great for, say, a stakeout. 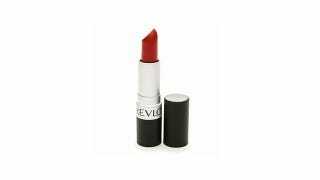 But Revlon Matte comes in lots of colors, and at under $7 each, you could probably buy enough for several disguises.